Pulled Nashville Hot Chicken Sliders are a take on Nashville hot fried chicken. Except you don’t have to turn on a hot stove in the hot summer! Easy to make in your crock pot! Three weeks and still no stove or oven! I can’t begin to tell you how painful this has been! If you want to drive a cook crazy, take away their appliances! Ugh! The first thing that I am going to do when I can cook again is fry up a couple of eggs and make toast with jam! I’m craving this like crazy! So this week I pulled out an appliance that I haven’t used in like 5 years, my slow cooker! I had to do something as we have actually been getting rain and I really needed a break from grilled foods. So this was a perfect excuse to use my illusive crock pot! LOL! 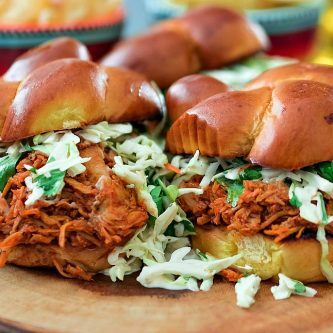 I know you are wondering what Pulled Nashville Hot Chicken Sliders are. Well, it’s a total riff on Nashville Hot Chicken or sometimes known as “Prince” chicken. “Hot chicken” is exactly as it sounds. Very fiery and hot. Typically, it’s fried but not my version. I had a hankering for spicy food and a crock pot, so a pulled chicken was the perfect compromise! Plus it’s been way warm outside to be frying anything! LOL! Hot chicken is always served with white bread and dill pickles so making sliders was kind a no-brainer! 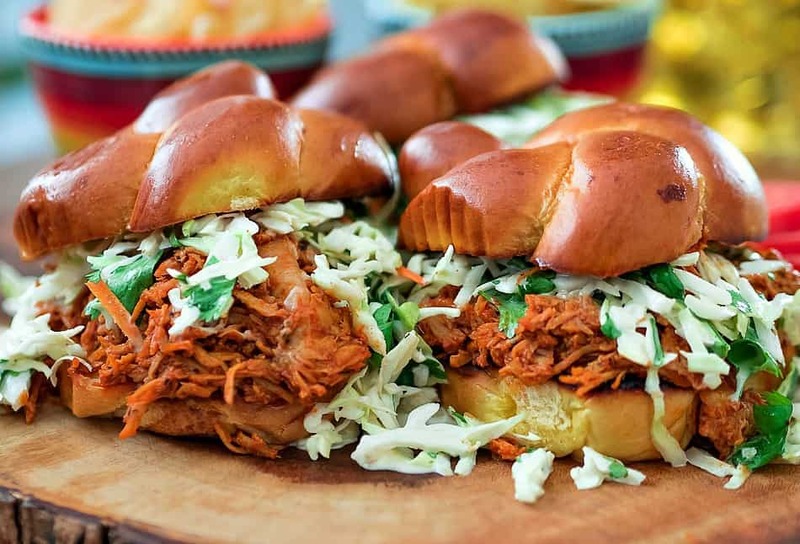 Pulled chicken or pork scream cole slaw and quite honestly, you will need cold cole slaw to tame the spiciness of the chicken. I added a little more sweetness with honey so that flavors balance out the heat so it’s not an in your face, burn your tongue off experience! Hot or not, it’s tasty! This recipe isn’t for the faint of heart. It will clean out your pores and make you sweat! You gotta like spicy! If you do, Pulled Nashville Hot Chicken Sliders are for you! Pulled Nashville Hot Chicken Sliders are a take on Nashville hot fried chicken. Except you don't have to turn on a hot stove in the hot summer! Easy to make in your crock pot! This recipe is fiery hot! You can tone it down by adding less cayenne pepper. In a slow cooker, add the oil, ketchup, honey, cayenne, chili, paprika, salt, pepper, garlic, and onion. Whisk to combine. Add the chicken breasts and coat with the sauce. Turn slow cooker to high and cook for 5 hours. When ready to serve, shred the chicken and combine with the sauce. Serve on toasted buns of your choice, a big dollop of cole slaw and dill pickles. 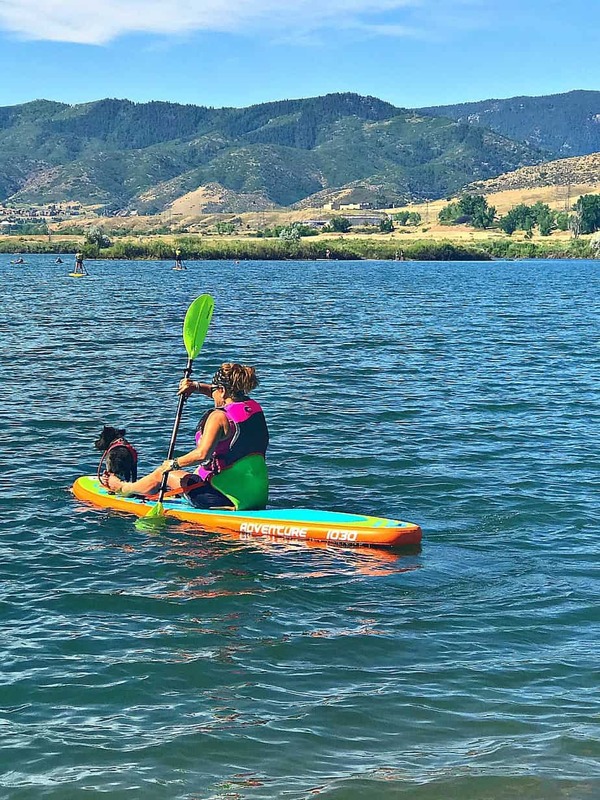 Me and my boy Tommy on my paddle board! He did great!